The story in brief: In 2026 the earth’s ecosystem has broken down under human abuse. Water supplies are shrinking. Rain is rare, and North America is gripped in the Great Drought with crops withering and forests dying. In the midst of environmental and social collapse, an old woman and a young man set out to heal nature and reactivate the cycle of flow by using techniques of higher consciousness. But the corporations that control the remaining water lash out to stop them. A blend of adventure, ecology, and mystic wisdom, Wellsprings: A Fable of Consciousness is a frightening but hopeful look into a future that is looming closer every day. Pack my rucksack and get out of this place. Like the song says, “I’m leavin‘ LA, baby. Don’t you know this smog has got me down.” Taj Mahal, a blues singer. I found his album — one of those old black discs — in a box with a bunch of others in granddad’s garage. Old record player with it, kind that goes around and ’round. Been listening to them ever since — all gramp’s favorites from the sixties and seventies when he was a kid. Great songs … despite the scratches. He said the smog then was nothing compared to what we got now. They didn’t have alkali smog back then. We’re breathing borax and potash blown in with the dust. Granddad died of emphysema but he never smoked. The doc said some people are more sensitive than others. I got his heredity. Mom and dad coughing, especially when they wake up. Even hear the neighbors coughing. Gotta get outta here. “We gotta get out of this place, if it’s the last thing we ever do.” Another song — The Animals. Little bungalow house like the others. Dust on all the window sills. Sand in the drain spouts. Hasn’t rained this year. Wind patterns have changed so it rains over the ocean but hardly ever over the land. Grass died, then even the weeds died. At least the dirt won’t die. The Great Drought, they call it. I don’t know what’s so great about it. We have plenty of time to enjoy the view because her motor home is weak on hills; we’re lugging at thirty m.p.h. It’s dark by the time we get to the campground. I like it much better here than the desert — the air is cool and fresh, and I can pitch my tent under a tree. We stroll in the Sequoia grove among trees soaring over two hundred feet towards the sky with massive trunks as wide as a house. Some are over a thousand years old. But they won’t get any older — an army of dead soldiers left standing at attention. But now the glaciers have melted and snow and rain are rare, so the falls are thin ribbons of water spilling over the cliffs then trickling through brown grass into what used to be the Merced River. We hear an occasional bird, but we don’t see them or any other animals. Jane finds a blue jay feather, which she sticks in her hair — but the jay is probably dead. We’re very quiet as we drive away from the park — as if we’ve been to Mother Nature’s funeral. We find a grassy glade in the forest, but the grass is dry and brittle and the tree branches droop from the drought. As we are spreading our blankets out to meditate, motion on the other side of the clearing catches our eyes. Out of the trees steps a black-tailed doe. She sees us and pauses, one foot raised, sniffing, listening, looking. Jane and I stare enthralled. As the doe gazes at us, our eyes join across the space, across the species. Communication flows between us: cautious curiosity about a fellow creature. She breaks contact, begins nibbling, then looks back at us as if saying, As long as you stay on your side, it’s OK.
We watch her in delight until she trots off, then we close our eyes to meditate. At first my mantra goes with my heartbeat then slows and goes with my breath. The sound stretches out into a long hum floating through me. I seem to be beyond my skin, filling the whole clearing. I feel like I’m sinking into the earth. I want to hold on, to keep from disappearing, but something tells me to let everything go. I free-fall through space, then realize it’s impossible to fall because there’s no down. I’m hovering … like a dragonfly over water. The sound fades away, leaving me without thoughts. I seem to expand beyond all space and boundaries to unite with everything. For a moment I know I am everything, the whole universe, but as soon as I think, I’m everything, I’m not anymore. I’m just Bob Parks sitting on a blanket over cold ground. I start the mantra again. Its whisper clears my thoughts away, and my mind becomes quiet. Part of me is watching the quietness of my mind and enjoying it. I never knew I had this watching part before. It doesn’t need to think. It’s just there, aware of everything but separate from it — a wise old part of me. I realize I’m off the mantra, drifting on thoughts, so I pick up the sound again and follow it as it gets fainter and finer until it becomes more visual, pulsing light behind my closed eyes. It seems to shine into something, a big cavern that’s inside of me but also outside of me. The boundaries between me and everything else disappear — no difference now between inside and outside. I can see dimly into the cavern. The walls and ceiling are crystal, its facets glinting in the mantra light. Below them in all directions stretches a vast dark sea of water, its ripples gleaming. It’s deep, deep as the earth, and I want to plunge in and dive all the way to the bottom. I’m sitting above it. Down there beneath me, beneath these rocks and dirt, rests the water. I want to jump up and yell, “I found it!” but that thought makes it disappear. I take a deep breath and am back sitting cross-legged on my blanket. Too stunned to say anything, I lie back and feel the ground under me, this good ground with all that good water under it. Now I’m feeling mean, so I want to tell her she’s a lot older than my grandmother. “I like you … very much. I really care about you. But not in that way. I’m too old for that.” She turns up the palms of her hands. “Don’t be sorry. I’m flattered. It’s just that ….” Her hands nervously stir the air. “Well, this is not the kind of thing one can forget, but we don’t need to do it. It’s nice that you would think of me in that way. But really ….” She shakes her head. “OK, I’ll be good.” I turn away in disappointment, not realizing how much I wanted her until she turned me down. “Good. Thank you.” She extends her hand for a conciliatory shake. I take it. It’s warm and soft. I can’t help staring at her breasts rising and falling as she breathes … heavily. “Please don’t be offended,” she says. It’s a long time before I can fall asleep. I keep thinking about her, sometimes mad at her, sometimes wanting her, sometimes both together. 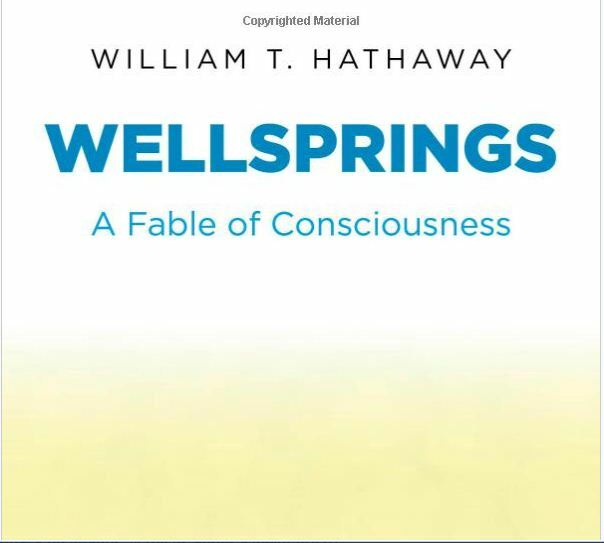 A further sample of Wellsprings: A Fable of Consciousness is posted at http://www.amazon.com/Wellsprings-Consciousness-William-T-Hathaway/dp/1780999941. William T. Hathaway’s other books include A World of Hurt (Rinehart Foundation Award), CD-Ring, Summer Snow, and Radical Peace: People Refusing War. A selection of his writing is available at www.peacewriter.org.